Middlebury begins postseason play today against Wesleyan in a rematch of a 78-77 overtime Panther victory January 12. The best indicator of future behavior is past behavior (or so the movie Side Effects claims), so we went back to the archives to analyze the regular season meeting between these two teams. Here are some of our observations. • Unlike Amherst, Wesleyan chooses not to double Peter Lynch in the low block. Pete missed a couple of good looks in the first half, but finished strong down the stretch and continually got to his spot on the floor. 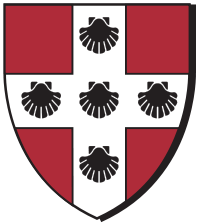 1) Which Wesleyan team will show up? It has been a frustrating season for Cardinals fans, who watched their team build first half leads against Middlebury and Williams, only to see them, much like must of the rest of their season, slip away. A team that some expected to finish third in the conference before the season had to win the final game of their season just to clinch a NESCAC Tournament berth. With many expecting a NCAA Tournament appearance from the senior-heavy Cardinals, Wesleyan finished 12-12 and 4-6 in conference play, including a loss at Hamilton. Now Shasha Brown, Derick Beresford and Mike Callaghan will have to win the NESCAC Tournament to receive an automatic bid to the NCAA Tournament to keep their hopes of ever reaching the Big Dance alive, an unlikely occurrence given that almost anyway the conference tournament shakes out, Wesleyan would need three consecutive wins against likely four of the six teams they lost to during the regular season (Middlebury, Williams, Amherst and, possibly, Tufts). It should make them desperate, however, and desperate teams are dangerous. We’ve already seen them raise their game once this season at Pepin Gymnasium, they can certainly do it again. 2) How much zone defense will Middlebury play? The 2-3 zone was effective early in the game and while Derrick Beresford managed to knock down a couple open threes, Wesleyan shot shut 34.7% from beyond the arc on the season and is unlikely to replicate the 7-14 three-point shooting from the first time these two teams meet. Further, Middlebury rebounded very well in the zone, limiting the Cardinals to just 1 offensive rebound in the first half. Given Brown’s success getting into the lane in the second half and his team’s long distance shooting woes, I would guess Middlebury will go back to the zone, which we haven’t seen much of since then, to try to slow down Joe Reilly’s team. Peter Lynch is a great low post scorer and could have a big game if Wesleyan opts not to double team him in the post. 3) Will Wesleyan defend Peter Lynch one-on-one again? Lynch finished the game 5 of 9 from the floor, but it could have, and should have been more like 7 or 8 of 9 as the Middlebury big man missed a couple of shots early in the game that he almost always makes. On Tuesday, Amherst crashed hard, bringing extra defenders when Lynch caught in the post and forced the Panthers forward to pass out of the double team, something he has struggled to do this season (11 assists vs. 27 turnovers in conference play). How these two teams adjust from the first time they played will have a tremendous impact on this game, and I’d be surprised if Joe Reilly and his staff decided not to double Lynch when he catches inside. He’s far too skilled a post scorer to be left on an island with just one defender. 4) How will Jeff Brown use his bench? Already missing Dylan Sinnickson for the season, the Middlebury coaching staff has also had to adapt to injuries to both Nate Bulluck and Dean Brierley, two of the team’s top reserve guards. The last time these teams met, Albert Nascimento came off the bench and sparked the team with a pair of big threes in the second half. Coach Brown can also choose to go to a zone with Nascimento in the game to avoid matching him up with either Brown or Beresford. Interestingly, in the earlier matchup between these teams, Chris Churchill, the Panthers’ 6’9” sophomore center saw 11 minutes off the bench, contributing 4 points, blocking 2 shots (while altering others) and taking an important charge on Callaghan to give him one of his four fouls. The Cardinals don’t have the size to match up with both Roberts and Churchill, something Middlebury exploited the first time around. Finally, James Jensen could play a big role in this game. He was limited by foul trouble last time, fouling out in just 18 minutes, but played well when he was on the floor and has really come on as the season progressed. He defended Callaghan really well, all but shutting him down in the overtime period before fouling out. If he can stay on the floor, his play on both ends of the floor could be the difference. 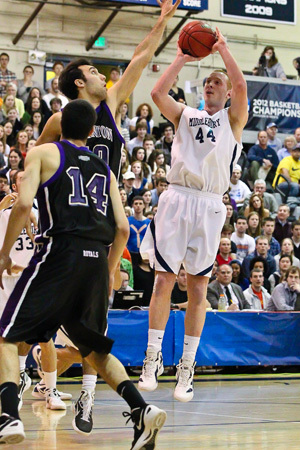 5) Can Middlebury play a complete game? When Jeff Brown’s team plays great basketball from wire-to-wire, they are nearly unbeatable. Sunday, Middlebury took Amherst to triple overtime despite trailing by 14 to start the second half. One of the things we questioned was whether the team could take its game to another level. The players answered that with a resounding yes, outscoring Amherst 40-26 over the course of the second half, and coming within an incredible, game-saving play by Willy Workman from winning the game. That same team (good and bad) was on display the first time these teams played as Middlebury fell behind early, trailing by 8 with 6:07 remaining in the first half before they reeled off a 12-1 run, which was part of a larger 31-12 run to take an 11-point lead with 13:35 left. That lead remained constant until the 3 minute mark, when Middlebury’s offense went stagnant and a number of impressive finishes coupled with poor perimeter defense from the Panthers brought Wesleyan right back into the game and forced overtime. Middlebury, which has struggled often this season with slow starts and poor finishes was outscored by a combined 21 points over the first 14 minutes of the game and the final three minutes of regulation. If the Panthers can avoid one of these two pitfalls they should win this game going away. Picks: We are going to pick each game during the tournament. For the first round, we are going all chalk (Amherst, Williams, Middlebury, Tufts). The biggest threat among the bottom four teams is Wesleyan, followed by Bowdoin, but both Middlebury and Tufts are playing well right now.